The adult mammalian brain is perhaps the most complex biological system under scientific study. Yet for all of its complexity, the brain develops from a simple epithelium. Throughout development, most neurons and macroglia are derived from embryonic neural stem cells that remain part of this neuroepithelium lining the brain ventricles. However, it is thought that neural stem cells in the adult brain, which are displaced to the subventricular zone of the lateral ventricle and the subgranular zone of the hippocampus, may have lost their epithelial properties. 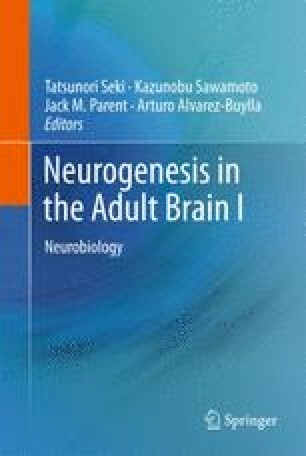 This chapter explores the epithelial organization of cells lining the ventricles in the adult rodent brain and reveals that a mixed neuroepithelium persists in the adult that contains neural stem cells in addition to differentiated, non-dividing ependymal cells. This work was supported by the National Institutes of Health (NIH) grants HD-32116 and NS28478, the Sandler Family Supporting Foundation, and the John G. Bowes Research Fund. A.A.-B. holds the Heather and Melanie Muss Endowed Chair. We thank Kenneth Xavier Probst of Xavier Studio for assisting with the design and preparation of Figs. 12.3 and 12.5.